After the successful launch of our SD Talks Special Series on Data for Sustainable Development in 2017, we are pleased to announce the 5th webinar session of the series. Jointly organised by the UNSSC Knowledge Centre for Sustainable Development and Data-Pop Alliance, this webinar session on ”Trusted Data Sharing and Artificial Intelligence Systems: Building Next-Generation Data Systems for Humanitarian and Government Projects” will be held on Thursday 2 August 2018 at 03:00 PM CET. 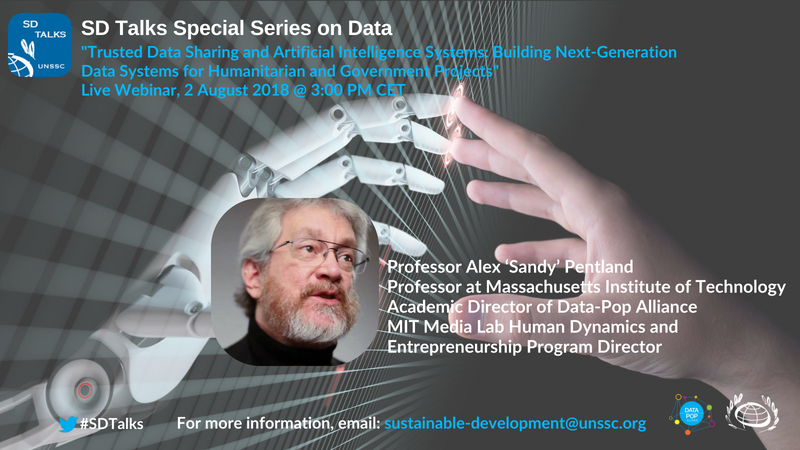 The speaker for the webinar session will be MIT Professor Alex ‘Sandy’ Pentland, Academic Director of Data-Pop Alliance, who directs the MIT Media Lab Human Dynamics group and Entrepreneurship Program, among other initiatives at MIT, where he also holds affiliations at the School of Engineering and MIT Sloan Business School. Prof. Pentland is a pioneer in the fields of human-computer interactions, wearables, and computational social science through the analysis of large-scale digital behavioral data. He previously helped create and direct the MIT Media Lab, the Media Lab Asia laboratories at the Indian Institutes of Technology, and Strong Hospital’s Center for Future Health. In 2012 Forbes named Sandy one of the ‘seven most powerful data scientists in the world’, along with Google founders and the CTO of the United States. To learn more about Prof. Pentland’s work, click here. The webinar will be followed by a Q&A session where the speakers will take questions from the audience. To join the live webinar, please go to https://bit.ly/2NYdBWK (event number: 959 000 354, event password: Data4SD). Please register for this webinar in advance by going to https://bit.ly/2NYdBWK, clicking on Register and entering your details.